Meadow View01263 715779work01603 870304fax Self-cateringMeadow View is set in the delightful Norfolk Countryside in the quiet hamlet of Burgh Stubbs. The perfect spot for a relaxing break away in this beautifully restored cottage with a large garden that has table and chairs and a barbecue to enjoy on a wonderful summer evening. This property is still only 4 miles away from Holt with antique galleries, great shopping and cafe culture there is plenty to see and do. 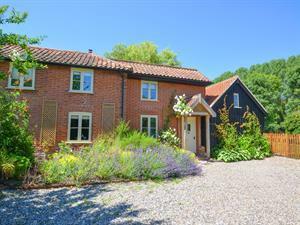 Meadow View is set in the delightful Norfolk Countryside in the quiet hamlet of Burgh Stubbs. The perfect spot for a relaxing break away in this beautifully restored cottage with a large garden that has table and chairs and a barbecue to enjoy on a wonderful summer evening. This property is still only 4 miles away from Holt with antique galleries, great shopping and cafe culture there is plenty to see and do.